TechTute brings you invaluable article in the field of IT and networking, and mainly focus on server administration, amazon web services and Cisco networking. 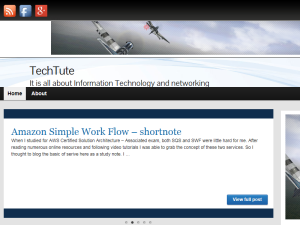 This what your TechTute Blog Ad will look like to visitors! Of course you will want to use keywords and ad targeting to get the most out of your ad campaign! So purchase an ad space today before there all gone! AWS CloudWatch provides custom metric monitoring. It is very useful when require to monitor performance of the custom application or server. Here we are going to guide how monitor Apache HTTP server performance using AWS CloudWatch custom metrics. All the installation and configuration performed on CentOS, most of the commands work on any LINUX / UNIX like system. If you need more details, you may can visit official documentation. I always try to attach official docs where it is possible. Once the installation is completed, you can verify installed version using following command. 2) Create IAM user with “Programmatic access” and assign following policy to the user. please note down “access key ID and secret access key” which is needed on next step. execute following command as root user. you must enter Key ID and secret key. you should enter region name where your EC2 instance is running. you can keep output format as none. ii) Then select Metrics menu from left hand side bottom. The post AWS CloudWatch Apache HTTP monitoring appeared first on TechTute. The post Solved – AWS RDS MySQL ERROR 1227 (42000) at line : Access denied appeared first on TechTute. In this tutorial, I would like to demonstrate how to use Letsencrypt ssl for a non standard web ports other than 80, 443 to generate a SSL certificate for an Apache. If you wish, you can follow same method to implement SSL on other web servers such as nginx and Tomcat as well. If you are new to Letsencrypt SSL, here is the brief introduction . Letsencrypt is a free, and non-profit CA (certificate authority) which owned by Internet Security Research Group (ISRG).
. you must create it before continue. Then after it will generate ssl certificate for your domain. The post Letsencrypt ssl for a non standard web ports appeared first on TechTute. you can get it from /etc/my.cnf if it’s defined on. To verify it or it’s not mentioned on configuration file, most probably use default location. #semanage fcontext -a -s system_u -t mysqld_db_t "/opt/newmysql_datadir/mysql(/.*)?" It should like below after updating. Apart from that we’ll need to add configuration for the MySQL client. Insert the following settings at [client] block which is at the bottom of the file. If it won’t start , you may need to troubleshoot by checking MySQL error log. You can make comments any issues if you have faced here, I’m always happy to assist you !! The post How to Move MySQL Data Directory to New Location on CentOS appeared first on TechTute. chrony can perform usefully in an environment where access to the time reference is intermittent. ntp needs regular polling of the reference to work well. chrony can usually synchronise the clock faster and with better time accuracy. chrony quickly adapts to sudden changes in the rate of the clock (e.g. due to changes in the temperature of the crystal oscillator). ntp may need a long time to settle down again. chrony can perform well even when the network is congested for longer periods of time. chrony in the default configuration never steps the time to not upset other running programs. ntp can be configured to never step the time too, but in that case it has to use a different means of adjusting the clock (daemon loop instead of kernel discipline), which may have a negative effect on accuracy of the clock. chrony can adjust the rate of the clock in a larger range, which allows it to operate even on machines with broken or unstable clock (e.g. in some virtual machines). chrony is smaller, it uses less memory and it wakes up the CPU only when necessary, which is better for power saving. chrony provides support for isolated networks whether the only method of time correction is manual entry (e.g. by the administrator looking at a clock). chrony can look at the errors corrected at different updates to work out the rate at which the computer gains or loses time, and use this estimate to trim the computer clock subsequently. chrony provides support to work out the gain or loss rate of the real-time clock, i.e. the clock that maintains the time when the computer is turned off. It can use this data when the system boots to set the system time from a corrected version of the real-time clock. These real-time clock facilities are only available on Linux, so far. ntp supports all operating modes from RFC 5905, including broadcast, multicast, and manycast server/client. However, the broadcast and multicast modes are inherently less accurate and less secure (even with authentication) than the ordinary server/client mode and should generally be avoided. ntp supports the Autokey protocol (RFC 5906) to authenticate servers with public-key cryptography. Note that the protocol has been shown to be insecure and it will be probably replaced with an implementation of the Network Time Security (NTS) specification. ntp has been ported to more operating systems. ntp includes a large number of reference clock drivers. chrony relies on other programs (e.g. gpsd) to access the timing data via the SHM or SOCK driver. then commented out default servers and add your own NTP servers . The post Configure NTP server (Chrony) on CentOS / RHEL7 appeared first on TechTute. Many web masters prefer to redirect non-www request to www. There are lots of different approaches for that and most famous one is using 301 redirection on the web server to handle this redirect part. Then what happen is, server must need to put extra processing for this redirection request. If the server have to handle thousands of request, it would not be efficient method at all. If your domain NS (name servers) is hosted with AWS Route53, you can use their own proprietary alias “record” to solve this problem. The traditional DNS, you cannot do it at all and you have to used 301 redirect instead as I mentioned earlier. Other advantage of the redirection is SEO improvement as some search engine recognize www and non-www as two different web sites and this cause to penalize the domain considering website has duplicate content. Here I’m going to demonstrate how to redirect non-www requests to www using AWS Route 53. So let’s look at. list may contains other records such MX, TXT as well, but you must select just your domain. when you select it, you can set following parameters from right hand side panel. select Alias Target as previously created S3 bucket from drop down. that’s how to do that. Comment here If you are having any question at all ! The post Redirect non-www requests to www using AWS Route 53 appeared first on TechTute. If you are the owner of TechTute, or someone who enjoys this blog why not upgrade it to a Featured Listing or Permanent Listing?